Linking to online catalogue has been resotred. Once again, please accept our apologies for the downtime in service. We are currently experiencing problems with our libgate service, which is stopping links to online content via our catalogue. The different phases of essay writing: planning, structuring, drafting, and editing. Participants should leave the workshop less stressed out and overwhelmed. They should have a completed introduction paragraph and a plan of action. NUI Galway has honoured the acclaimed Irish actor, Stephen Rea, by conferring on him an Honorary Doctor of Arts Degree. Rea has amassed a career in the performing arts on both stage and screen that has seen him portray a rich lineage of complex characters who are deeply connected to the Ireland of its time and place and also to an international connection to the wider world. 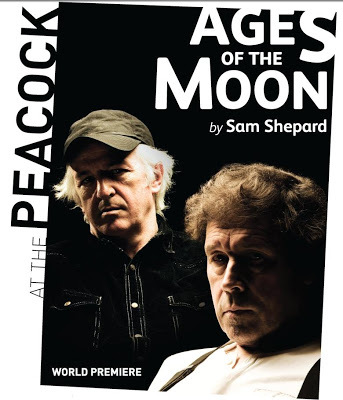 "Stephen Rea has taken us around the world and through time, inhabiting souls whose fragile and often violently conflicted layers of self have laid bare struggles for identity and connection that are fundamental to the human condition. He is one of the most recognizable faces of the stage and screen, yet always unfamiliar, shape-shifting to meet the terms of the worlds he has inhabited through his work. Through his characters, he has brought us face to face again and again with the brutal and divisive politics of our small island and elsewhere." Within the archive collections of the Hardiman Library there is a vast array of records that document and highlight the relationships between Rea and writers, playwrights, directors and theatres that have shaped his career. 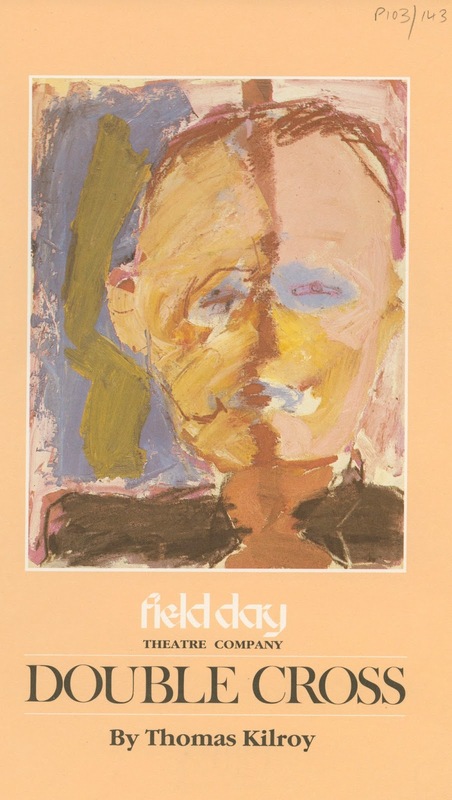 A key relationship is to Irish theatre via Field Day Theatre Company, whom Rea was a founding member and also the connection with the playwright Thomas Kilroy, himself a later member of Field Day and the author of Double Cross, written for Rea and produced in 1986. The plays of Brian Friel again have a large presence in the archives through Field Day records but also via the archive of the Abbey Theatre, digitally available at the Hardiman Library, along with the Thomas Kilroy archive and many other related literary and theatrical collections. 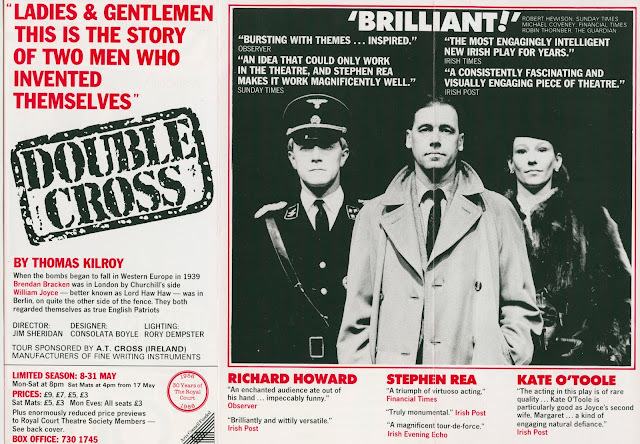 The Kilroy archive contains manuscript drafts and notes of the play Double Cross, programmes and flyers and also correspondence with Rea as well as a range of records relating to Field Day Theatre Company. Rea starred in many Friel premieres for the Abbey Theatre, including the Freedom of the City (1973) and Aristocrats in 1979 and also Making History for Field Day Theatre Company at Derry in 1988. Here is a selection of some archive material from these productions as we honour an congratulate Stephen Rea. For more coverage of the honourary conferring and for video interviews with Rea please click here. Open access publishing operates in parallel with conventional publication channels such as journals by making research outputs accessible free of charge online and without subscription barriers, sometimes after an agreed period has elapsed since initial publication. The benefits include increased visibility, usage and impact. ARAN facilitates open access publishing for University authors by collecting, preserving and making freely available scholarly communication, including peer-reviewed articles, working papers and conference papers created by NUI Galway researchers. As well as increased visibility, usage and impact making your research available on ARAN enables you to comply with the open access publishing requirements of funders. ARAN also provides for the long-term preservation of your publications in a unique collection of research output from NUI Galway. New features include the display of usage data for each item alongside Scopus citations and Altmetrics information where available. Altmetrics provide data about the social media use of publications. The official published version of each article is now explicitly promoted in ARAN and search features have been enhanced to include discovery filters for author, subject, date issued and type. This important research resource is now available for consultation at 704.9470938 LEX in Humanities and Social Sciences Reference on Floor 1 of the Library. This is the essential reference point for studying how Classical mythology is represented and re-created in ancient art. The paired volumes of text and illustrations are authoritative beyond anything available elsewhere, on-line or off-line. The Lexicon will be an important permanent resource not only for Classics but also for scholars and students in many other fields. JSTOR have confirmed that access should now be fully restored. We have tested access from both on and off campus and it seems to be working fine again. If you are continuing to have access problems with JSTOR or any of our resources, make sure you have signed into your Library account first. If the problems persist, you may need to clear the cache and cookies of your browser to ensure you're getting the most recent version of the page you're visiting. 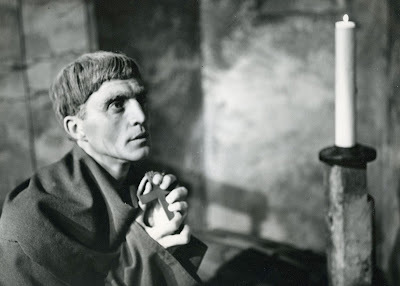 Unfortunately it looks like access to JSTOR is patchy again. We have requested that JSTOR will confirm when the issue is fixed; in the meantime our access may continue to be disrupted. The global issue affecting JSTOR is being resolved, and access has been restored. We will be monitoring the resource today to ensure we continue to have seamless access. Note: if you are continuing to have access problems with JSTOR or any of our resources, make sure you have signed into your Library account first. If the problems persist, you may need to clear the cache and cookies of your browser to ensure you're getting the most recent version of the page you're visiting. The JSTOR database is currently experiencing global difficulties. As a result of this, access to the database is very intermittent. While you may be able to access and search JSTOR, it is not authenticating correctly, so we are being denied fulltext access to content. The issue has been reported to JSTOR, and is it is a global problem, it is being worked on as a high priority. Apologies for the interruptions in access. We will update this post as hear more details. 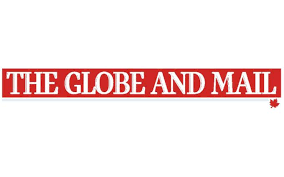 Database trials of two Canadian newspapers, The Globe and Mail (1844-2012) and Toronto Star (1894-2011) are now available until 31 October 2015. This seminar is part of International Open Access Week. Open access is a hot topic, bringing challenges and opportunities for universities and researchers, with different models operating worldwide. 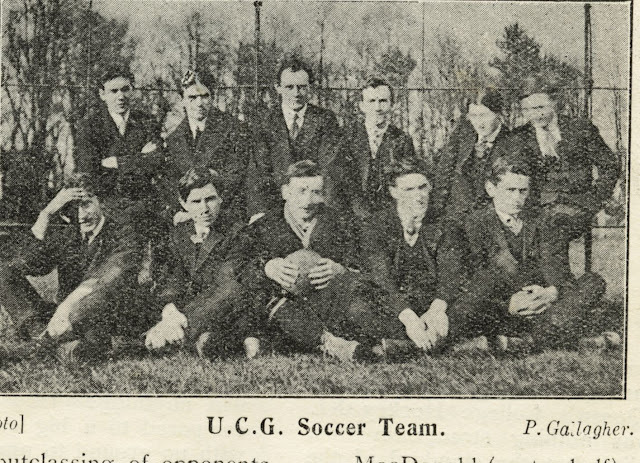 The seminar features presentations by two NUI Galway academics, Dr. Emer Mulligan and Professor Tim O'Brien, who have an editorial role in journals operating Green and Gold models. There will also be an overview of the University’s Open Access Policy, recently adopted by Academic Council, along with a demonstration of new features available on the ARAN (Access to Research at NUI Galway) system managed by the Library. Professor Lokesh Joshi, Vice-President for Research, will join the discussion. It is with great sadness that we note the laying to rest of Brian Friel yesterday. 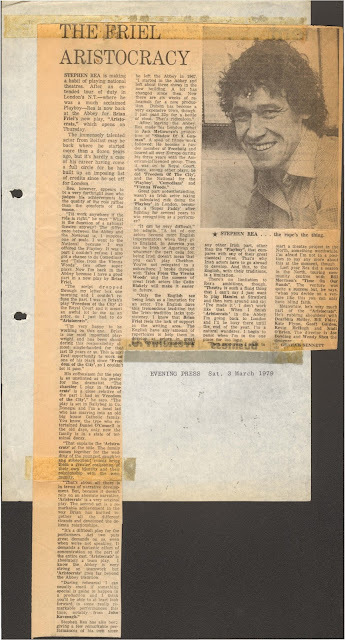 A quick look through our archival holdings shows the range and influence of Brian as a playwright and a friend to various theatre people for well over fifty years. From writers such as John McGahern and Thomas Kilroy, to a variety of theatre companies and actors, the energy and enthusiasm he brought to Irish theatre is clearly visible. 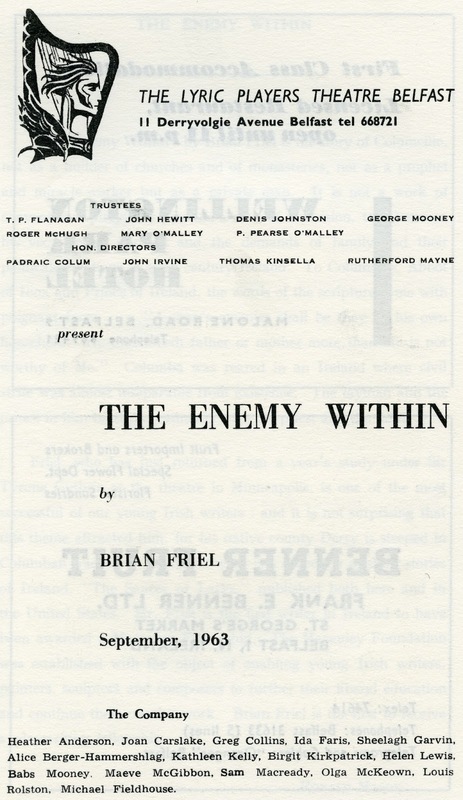 In September 1963 the Lyric Theatre staged "The Enemy Within". 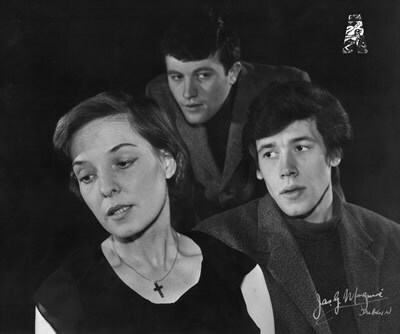 Featuring George Mooney in the role of Columba, it was one of a number of plays staged by the Lyric Theatre Company from young emerging Irish writers in the late fifties and early sixties. 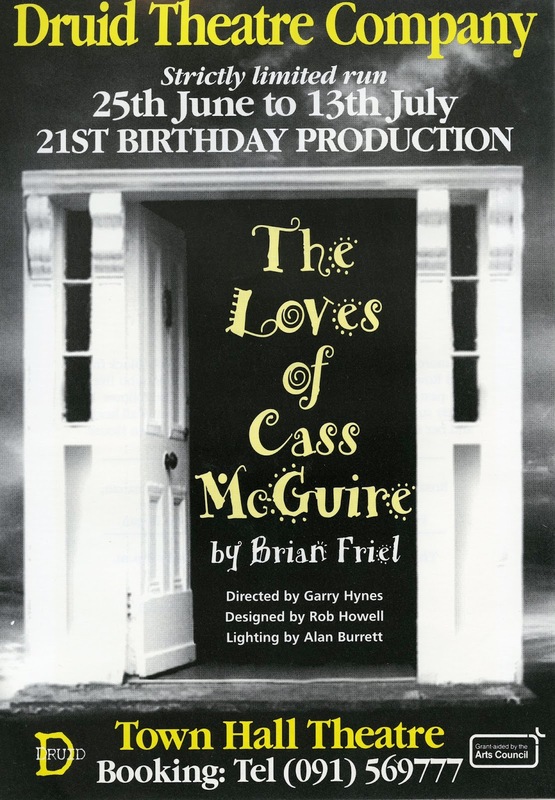 Another play which features strongly in our collections is the "Loves of Cass Maguire". 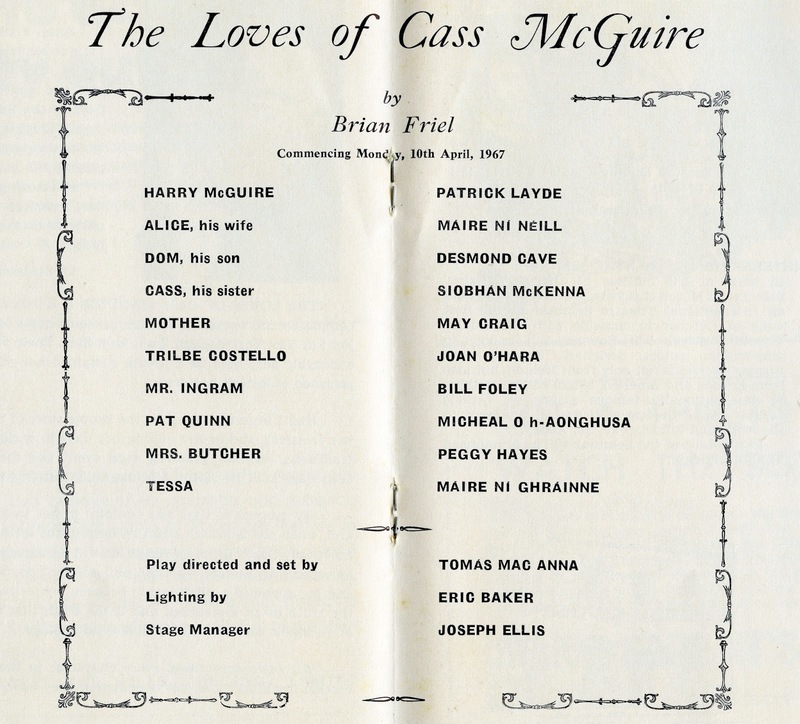 Siobhan McKenna's role as Cass in the Abbey's 1967 production introduced one of the most enduring characters to an Irish audience. It was also one of the plays staged by the Druid Theatre Company in their opening production in the Summer of 1975, revived in 1996 for the 21st anniversary production, both productions starring Marie Mullen. The Abbey Theatre Digital Archive, uniquely available at NUI Galway, captures the legacy and engagement of Brian Friel with Ireland's national theatre. 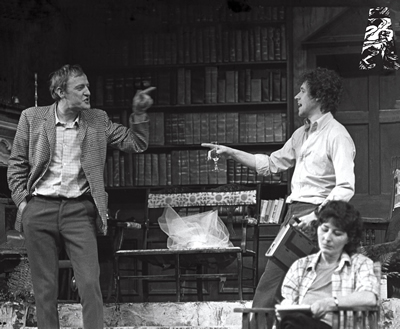 The Abbey would première some of Friel's most powerful plays from the 1970s to present day, including The Freedom of the City (1973) Volunteers (1975) Living Quarters (1977) Dancing at Lughnasa (1990) Wonderful Tennessee (1993). The Abbey archive contains scripts, prompt scripts with detailed annotations, posters, programmes and recorded videos of performances of many of Friel's landmark works. 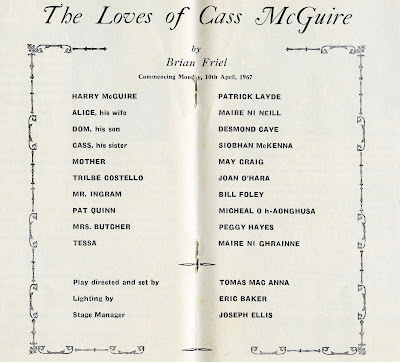 With around ninety references to Brian in our online holding search engine, available athttp://www.calmhosting01.com/NUIG/CalmView/default.aspx why not take a virtual tour through our holdings to appreciate the impact of one of Ireland's great playwrights on Irish theatre. Resulting from major damage to the Medical Library facility, due to the recent fire incident at the Clinical Sciences Institute, the Medical Library will remain closed until late October/early November at the earliest, whilst structural and cabling repairs are on-going. 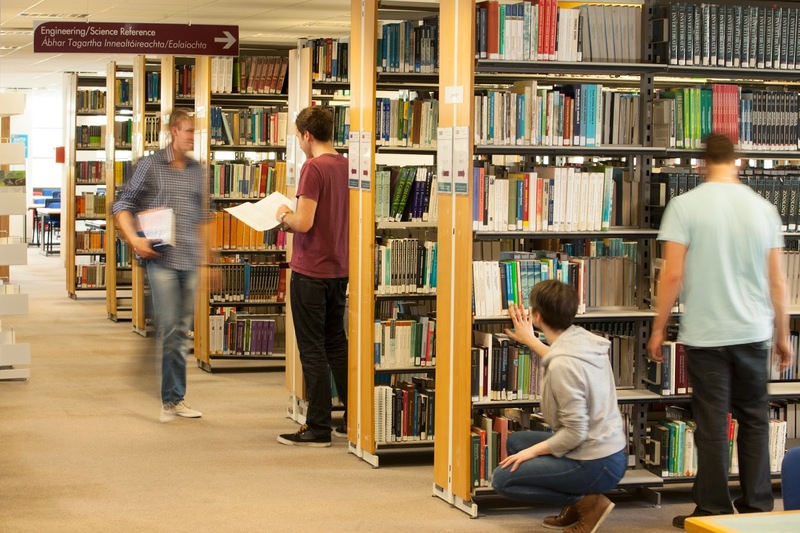 Due to the nature of the works involved all access to the Medical Library has been suspended, and it is therefore no longer possible to retrieve books on behalf of users. Please note that we provide online access to a large range of medical titles in e-book format which can be accessed via the catalogue, and that if you have a problem in relation to acquiring information on a specific topic you can contact a member of the Medical Library staff who will work with you to identify alternative information sources. We apologise for the on-going inconvenience caused. With over 500,000 books, 400,000 e-books and 70,000 e-journals in the Library finding the book or journal you want could feel like finding a needle in a haystack. Come along to our Finding Books and Journals training and in just 30 minutes discover how easy it is when you know how! How to put a hold on a book that's in high demand, so the next available copy is reserved for you. How to renew your books online and avoid paying fines.